Let’s be clear from the get go: this article is for those who love coffee. And I mean really love coffee. Love it so much that even considering going through a single day without a perfectly brewed cup is simply out of the question. But it’s also for those who love the outdoors. You know, like really love it. Coffee in the wilderness. What… a… combo! For many coffee lovers part of the appeal (read obsession) is the ritual that comes with its creation: getting the temperature of the water just right, brewing for the perfect amount of time, pouring it from the right height and enjoying it in your favourite mug that is, of course, just the right size, shape and feel. And the finale of that ritual is the drinking experience itself. Naturally the taste and sensation of great coffee is what keep people coming back for more. But the environment in which one consumes coffee can greatly affect the overall experience. So put an outdoor obsessed coffee drinker into a remote, beautiful and serene setting (that they’ve probably worked damned hard to get to), give them access to making their perfect brew, and you’ve just created a little piece of heaven for them. Add in said persons favourite people, preferred topic of conversation and a naughty sweet treat to share around – total bliss. However, perfectly brewed coffee and wilderness wanderings don’t often come together as often or as easily as one might wish them to. Many lightweight coffee makers don’t quite cut it when it comes to barista standard coffee. And the alternatives are just too heavy to justify carrying (having forked out way more that you probably should have on ultra lightweight gear to save that extra pound you’ve been working so hard at shedding from you pack). So with a little searching around, experimentation and of course the drinking of many cups of coffee in more than one exceptionally beautiful location, may I present to you the ultimate wilderness coffee kit. First up, you need to make sure your coffee is stored properly. You’ll need something airtight and lightweight. A good old mini tupperware pot seems like the simplest option. But if there’s even a tiny risk of that indescribable tupperware ‘flavour’ polluting your perfect grind, then you may as well just give up now. If you’re picky about coffee making, then you should be picky about how it’s stored. Aluminium foil bags are ideal for coffee storage as they reseal, keeping the air out and the coffee in. They are fully waterproof with a low profile making them ideal to slip into the pocket of your backpack, or inside your cooking pot. And most importantly the bags come fragrance free! To keep your wilderness coffee kit as light as possible there is only one option you should consider to heat your water: the MSR Pocket Rocket 2. Weighing a minuscule 73g, this improved version of the earlier Pocket Rocket is so small that it fits inside a mug, allowing you to keep your whole setup as compact as possible. But it’s not just weight and size that are so impressive. The Pocket Rocket 2 boils a litre of water in an exceptionally fast 3.5 minutes, and has more protection against the wind than ever before. Check out our full review of the Pocket Rocket 2 for more details. Choosing the perfect cooking pot to boil up in is a tricky one to decide upon. There are a number of excellent options that are all lightweight, compact and high quality. To keep your coffee tasting as pure as possible, your cook pot should ideally be made from titanium as it leaves no metallic flavour in your water, and it doesn’t rust like other metals. The Snow Peak Titanium Mini Solo Cookset steps up to the job for more than just its low weight (156g) and titanium strength. With a 0.85l capacity that is just enough for two cups of coffee, it is also just big enough to store a small gas canister AND your tiny Pocket Rocket 2 inside. There are foldable handles on the side to keep things streamlined, and the lid fits securely to keep boiling times as short as possible. If you’re happy using the 300ml capacity mug to sip your coffee from then your setup will be even more streamlined, as the pot nests inside the mug snuggly. However, if you prefer something a little more fine-tuned in your coffee mug, then read on for some exceptionally high quality (and ridiculously high priced) options. Your hot water has reached that all important perfect temperature and you’re ready to get brewing. It’s coffee time! Queue the AeroPress. Not only is it perfect for on the fly brewing due to it’s lightweight and compact nature, it also makes incredibly good coffee. So good that it is the preferred method of brewing in many cafes. Yep, you really can get barista standard coffee in the middle of nowhere! The AeroPress is simple to use, but like any craft, the more you practise using it the better the result. Any excuse! It uses paper filters, makes 1 to 3 cups of coffee per press, and AeroPress claim that it “yields the smoothest, richest coffee that you have ever tasted.” Now I’m certainly no expert when it comes to coffee tasting. But I know what I like, and what I don’t. And I have only ever had excellent coffee from an AeroPress. Some people claim that everything tastes better when you are outdoors, but my indoors AeroPress coffees have been equally as impressive as those I’ve worked hard for on windswept mountainsides. And now for the pièce de résistance in your wilderness coffee making journey… the mug. In my opinion, a bad mug can alter the coffee drinking experience a great deal. The weight, shape and size of the mug are all very important. As is the thickness of the lip, the feel of outside on your hands, the presence of a handle and its shape, and whether the mug keeps its contents hot for long, or not. 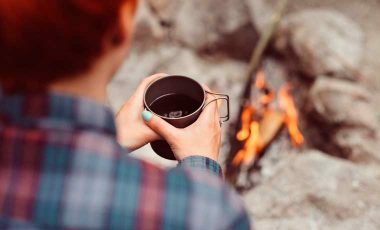 And as all of these factors come largely down to personal preference, here are a few options that may appeal to those prioritising different things in their ideal camping coffee mug. (Just don’t look at the price tag too closely!). So now that you’re all over making the perfect coffee, all that’s left is to find the perfect place to enjoy it! Wherever that happy coffee place may be, may you enjoy your coffee rituals from start to finish for as long as we are lucky enough to have excellent coffee in our lives.